What ‘California’ Food Item would You Want on the Ark? The Ark of Taste is an international, Slow Food program that identifies small-scale, quality food items associated with the cultures, history and traditions of the entire planet; it is an extraordinary heritage of fruits, vegetables, animal breeds, cheeses, breads, sweets and cured meats. The Ark was created to point out the existence of these products, draw attention to the risk of their extinction within a few generations, and invite actions to help protect them. In some cases this might be by buying and consuming them, in some cases by telling their story and supporting their producers, and in others, such as the case of endangered wild species, this might mean eating less or none of them in order to preserve them and favor their reproduction. What you can do to help us is to identify wonderful food items, associated with California, that are not widely available commercially. Here are some examples of items that have recently been recommended. 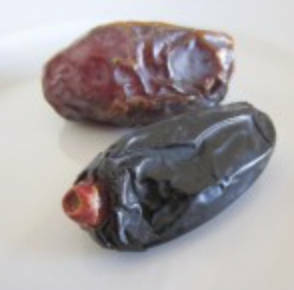 Abada Date Palm – This date resembles the Deglet Noor Date but has shorter fruit stalks. The flesh is soft and melting with a very sweet flavor and has been generally well received by those who have tasted it. The fruit color goes from deep red to black with moderate to heavy bloom lending a purplish cast as fruit matures. The Abada date was discovered by D.G. Sniff growing wild in a riverbed in Brawley, California in 1936. After observing its strong qualities, the varietal name was created out of the first names of Sniff and his wife, Abby and Dana. Most of the offshoots were sold to Sunnipalms, a date garden near Indio, California, where there were 18 palms of Abada in production in 1955. Emmett’s Cherry – This cherry is a 130 year+ old heirloom with fantastic unusual, very dark purple, almost black, sweet cherries with an amazing, complex flavor! Unlike most sweet cherries, this one is not too sweet, with a mature Brix of 24°; however, it fills the mouth and touches the senses with a complex, unique taste. The Felix Gillet Institute found the only known tree of this variety on an old homestead near the Camptonville stage stop, where it has survived for many years. It receives no pruning, spraying, fertilization or irrigation. In 2013 we estimate it had 300-400 pounds of excellent cherries. 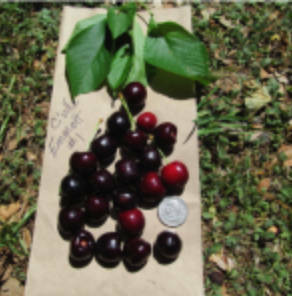 In the winter of 2014/15, Emmett’s Cherry will be available as a grafted, dormant bare-root from the Felix Gillet Institute. 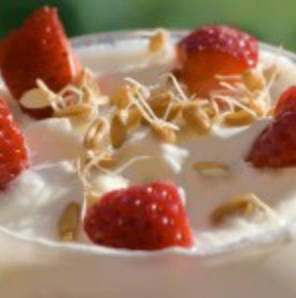 Creole Cream Cheese – Cheese An example from outside of California is Creole Cream Cheese. Whether eaten as a savory or sweet part of a meal, Creole Cream Cheese is a celebrated part of the New Orleans culinary tradition that dates back 150 years to the region’s first French settlers. This cheese is similar to Neufchatel and other fresh farmhouse style cheeses with a taste somewhere between ricotta and crème fraiche, and with an underlying hint of buttermilk. Creole Cream Cheese is customarily served with a sprinkle of sugar, drizzle of syrup, or mixed with fresh fruit, as well as eaten spread on bread or crackers. With the establishment of state dairy regulations, Creole Cream Cheese began to disappear along with its small dairy producers, as they could not afford the investment required to meet the new regulations. Traditionally-made Creole Cream Cheese was relegated to the collective food memory past of New Orleans, until John Folse of Gonzales, Louisiana and Kenny Mauthe of Mauthe’s Dairy began producing and marketing this local favorite.